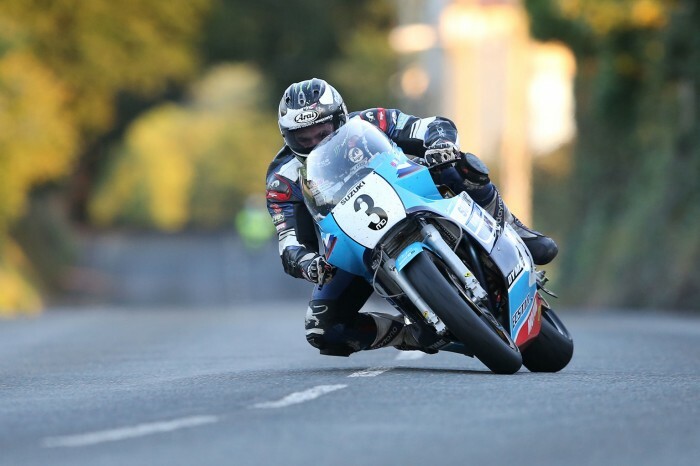 Michael Dunlop took his second win of the day on the Isle of Man when he broke lap and race records on the Team Classic Suzuki to win the Superbike Classic TT race. The Ulsterman led from start to finish and although Dean Harrison (Silicone Engineering Kawasaki) closed to within three seconds just after half race distance, he soon pulled away to take a comfortable win by almost twenty seconds. James Hillier took third on another ZXR750 Kawasaki, this time in the colours of Greenall Racing. Dunlop grabbed the lead at Glen Helen at the first time of asking, his advantage over Hillier 2.4s with Harrison, Ivan Lintin and Dan Kneen in hot pursuit. Bruce Anstey was back in eighth place whilst Steve Mercer, who started at number one on the Mistral Racing Kawasaki, was an early retirement at Sulby village having gone through the speed trap moments earlier at just 34mph! As the lap wore on, Dunlop began to edge away but Harrison was now up to second having overhauled Hillier on the run from Ballaugh to Ramsey. Indeed, Harrison was keeping Dunlop in check and whilst the latter was quickest at 125.872mph, his lead was only seven seconds at the end of the first lap. Harrison’s lap of 125.026mph was, at that stage, the quickest ever 750cc lap around the Mountain Course, quicker than Jim Moodie’s 1999 mark of 124.45mph and that put him 4.6s clear of Hillier as Kneen, Lintin and Gary Johnson completed the top six with the top 11 riders all over 120mph. Dunlop still led at Glen Helen second time around, the lead having extended to just under eleven seconds. Harrison was still four seconds clear of Hillier but Kneen’s strong ride ended at Glen Darragh promoting Lintin up to fourth. It was clear that Dunlop was on record-breaking pace on his second lap and he was timed at more than 127mph from Ramsey to Ramsey. He was continuing to extend his lead over Harrison and with his second lap speed being 126.808mph, a stunning new lap record, the gap had stretched to 18s, even though Harrison himself had gone quicker at 125.512mph. Hillier, Lintin, Michael Rutter and Johnson were holding station in third to sixth but the last named overshot his pit crew and had to reverse back up pit lane losing close to two minutes. Meanwhile, Conor Cummins, down in 26th at the end of the first lap, had also broken the lap record with a speed of 126.222mph hauling him up to 12th and giving him the fastest ever 750cc rider tag. The pit stops had clearly seen riders gain and lose time and at Glen Helen on lap three, Dunlop’s lead had plummeted to just 2.3s primarily due to Harrison not changing his rear tyre. Hillier was still in third but Rutter and Anstey were up to fourth and fifth as Lintin dropped back to eighth. Dunlop’s rear tyre was slowly getting up to temperate though and as the lap progressed, he reasserted his control on the race, the lead by the Grandstand as he set out on his final lap back up to 13 seconds. Hillier, Rutter and Anstey continued to hold onto third to fifth but Jamie Coward was now up to sixth due the problems experienced by Lintin and Johnson at the pits. Harrison’s hopes on lap three were certainly extinguished on lap four as Dunlop built on his lead throughout the lap and the Ballymoney man came home for his second win of the day, the final winning margin being 19.2s. Hillier’s strong ride saw him take a good third with Rutter, Coward and Horst Saiger filling out the top six after Anstey stopped on the final lap at Glentramman. The top ten was completed by William Dunlop, Cummins, Johnson and Danny Webb after Lintin retired at Signpost Corner less than two miles from the finish.